Meet Air Force Captain and veteran Graciela Tiscareño-Sato, daughter of immigrants and former aviator who served for nine years on active duty globally. With this NEW offering, it’s like the author is in your classroom speaking directly to your students. You’ll share Graciela’s unique professional journey with your students – a video greeting and a 14-minute “class” filled with photos and video to follow her from her childhood in a large Spanish-speaking family to a prestigious university on a 4-year Air Force ROTC scholarship to the flight deck of the refueling jet she flew in while in the U.S. Air Force and to many countries around the world. She shares highlights from her aviation career that inspired her to write the 1st-EVER bilingual children’s book series about women in the military. This motivational 15-minute author bio is a great lead into YOU reading these educational AND inspirational books to your students. The Virtual Captain Mama Package is available in both Spanish and English so students can learn how the oldest daughter of Mexican immigrants prepared to leave home for college and then on to global aviation adventures. The author shares why she wrote these unique books in two languages. After this virtual visit, your students will be ready to interact with Graciela via Skype or Google Hangouts to ask the many questions that will pop into their curious minds! “I learned so much and was really “Wow!”ed by the courage and hard work demonstrated in your service, your positive message for kids and the strong role model you provide in our community.” -Sally Thomas, Supervising Librarian, Hayward Public Library. 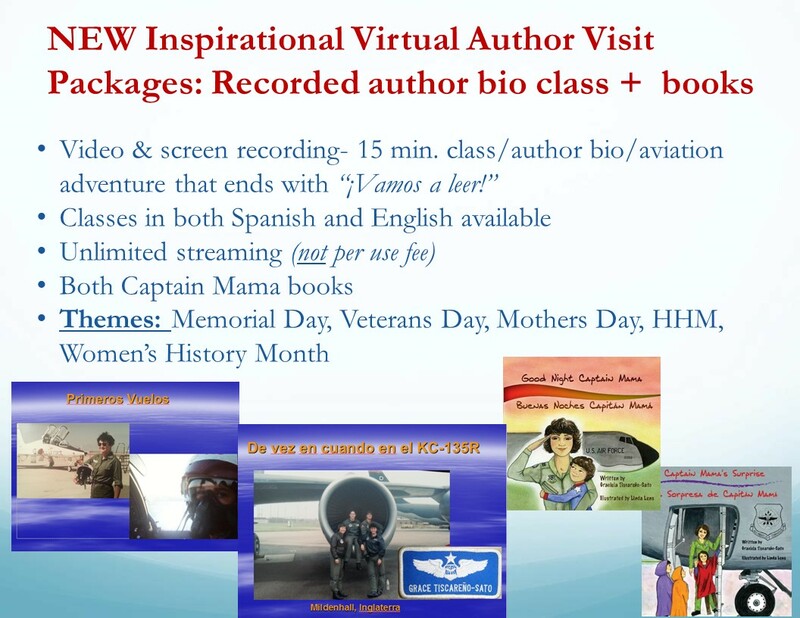 Captain Mama Virtual Classroom visit - SPANISH Language (CLASS ONLY, NO BOOKS.) This digital product is for those who have previously purchased a Captain Mama book for use in the classroom. Play the presentation first; read the book immediately after. Captain Mama Virtual Classroom visit - English Language -CLASS ONLY, NO BOOKS. This digital product is for those who have previously purchased at least one Captain Mama book for classroom use. Play the presentation in class; read book immediately after.